Here are some Unitarian Universalist Views of Evil. "Unitarian Universalists and other religious liberals have always emphasized the positive aspects of the divine and human nature. As a result, critics sometimes charge that liberals don’t truly understand the reality of evil…For religious liberals, evil is not a supernatural force locked in a cosmic struggle against the forces of good. Liberals also do not worry much about the traditional “theodicy” problem—how evil can exist if God is both all-loving and all-powerful. For liberals, evil is neither a demonic spirit nor a philosophical dilemma, but a reality to respond to and confront." "Sometimes I use a very subjective, almost subconscious barometer when reading the news of the day and deciding whether some action bears the weight of the word evil. It’s not the magnitude of an event, nor the cold-heartedness of those involved, nor even the historical impact. It’s the degree of heartbreak that I feel: beyond sorrow or horror, a sense that something has been blasted apart, a shattering of hope, the collapse of what I thought or wished were true about the world and human nature. There are some truths, some news, that break the heart—not permanently, but utterly, for a while, as the realization forms perhaps for the thousandth time: this, too, is part of our humanity. Evil is the capacity, within us and among us, to break sacred bonds with our own souls, with one another, and with the holy. Further, it is the willingness to excuse or justify this damage, to deny it, or to call it virtue. The soil in which it flourishes is a rich compost of ignorance, arrogance, fear, and delusion—mostly self-delusion—all mingled with the sparkling dust of our original, human being." "What is evil? An aspect of human nature. Apply enough pressure to any of us and something ugly will surface. Evil isn’t some malevolent power floating around in the universe, waiting to penetrate some unsuspecting soul. We do it all by ourselves. To acknowledge evil is to see something we don’t want to see. We all cultivate an idealized view of ourselves. Self-knowledge takes hard work. Overcoming evil begins with being honest. Reckoning with evil is more than an internal struggle. Evil surfaces in the cycles of violence we perpetrate as a society, often out of a misguided sense of necessity. It is a studied ignorance that keeps us not only from examining ourselves but also from looking critically at the institutions we create. The power to overcome evil has as much to do with overcoming our numbness and helplessness about what is wrong in our world as it does with mastering our impulses. Whether humanity will ever be free of the cycle of violence, we cannot say… But the change begins only when we are willing to learn the truth, and dedicate that fearful knowledge to the struggle." "I see evil as the willful separation from, and lack of concern for, the “common good.” Evil occurs when the capacity for empathy exists and is ignored; when better alternatives for being in right relationship are ignored; when we fail to act on the imperative to correct the discrepancy between what is and what ought to be; and when we resist our powerful impulses to be, and do, good. … We are products of our evolutionary heritage and our cultural history. We might transform evil if we recognize our own complicity in the processes which engender and sustain it. We will overcome evil when we refuse to play the game or to be silent, when we make a determined effort to understand evil as a possibility that awaits transformation. Then we might inhabit a safer, more peaceful, and more just world." As Unitarian Universalists, we don’t talk much, if at all, about evil. And yet, there that word is in one of our Sources. “We affirm and promote the words and deeds of prophetic people which challenge us to confront powers and structures of evil with justice, compassion, and the transforming power of love. Perhaps we don’t talk evil about because of Universalist forebears who didn’t believe in a hell or a devil. Perhaps we don’t talk about evil because of our Unitarian forebears who believed that we could overcome our basest instincts. Perhaps we don’t talk about evil because our humanist forebears who found this term too related to the supernatural. But friends, if we get tripped up in even examining the work “evil”, how on earth are we as a denomination—or a congregation—going to be able to confront powers and structures of evil? We have a pluralist community here. Each of us has a different belief systems. We each have very different understandings of what evil is and how we confront it, within and outside ourselves. As you heard during the readings, not even Unitarian Universalist ministers have a unified understanding of evil. Just like we don’t have to have to think alike to love alike, so to we don’t have to have a line-by-line shared understanding of evil in order to confront it. The dictionary isn’t much help either, defining evil with language such as: morally reprehensible, sinful, wicked, arising from actual or imputed bad character or conduct, causing discomfort or repulsion, offensive, disagreeable, causing harm, and my personal favorite: marked by misfortune. For today’s sermon, I suggest that we agree on a few things about a definition of evil so we can explore a few ideas. First the definition of evil we will use today is not based on the devil or demons or supernatural intervention. In the UU World, Patrick O’Neil (winter 2007) wrote: “We UUs do not have the “easy” solution of a theology that blames all evil on the workings of some devil. But many of us have witnessed unspeakable human acts that can only be described as evil: in Auschwitz, Cambodia, Dresden, Rwanda, and in the barbarity of biological germ warfare. Some formalists would argue that the very existence of evil in the world would seem to negate our humanist valuing of [affirming and promoting the] dignity and worth in every person, expressed in the First Principle of Unitarian Universalism.” I have certainly struggled with the balance of affirming our First Principles and confronting horrible atrocities, serial killers, and other human behaviors that have harmed so many. Worth and dignity for these people? Really? My first response more often is a great deal of anger and fear. Anger at what was done; and fear that this kind of violence might happen to me or someone I love. 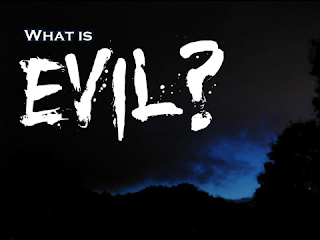 But back to a definition of evil to start with for today: harm done by one person to one or more creations (people, animal or planet), either directly (intentionally) or sideways. Okay, what is “sideways”? There is a potential to do harm within all of us, harm that has its roots in pain we have experienced due to unresolved hurt, guilt, or resentment, or a lack having some psychological need met that resulted in a hole within a person’s personality. Think of that potential in terms of a tea kettle on a burner. There is pain bubbling up within, and eventually the pressure builds up to the point it has to spew out somewhere, often hurting an unintended victim. The pain comes out sideways. Even as we explore this definition, we also need to consider how our personal understanding of evil affects each one of us. This, too, is part of who we, as a species are. Just because we might not be committing “unspeakable acts” doesn’t mean we don’t have the capacity to do so, and I think that’s a hard concept for Unitarian Universalists to come to terms with. Unitarian Universalists are not fluffy bunnies of eternal sweetness and light. We’re human, just like the serial rapists, the murderers, the so-called evil doers. We’re all of us human. Let me share something that Reverend Erik Walker Wikstrom preached: “The problem of evil, as I see it, is that we are so readily tempted to imagine that it’s out there, separated from us over here; that it belongs to them and not us. And that, I believe, is ultimately the root and the design of evil—to make us categorize the world into us and them rather than recognizing our common kinship…the core of our Unitarian Universalist faith—and the core of all the religious faiths that I know of—points to the truth that we are all a part of a family that includes all of creation…’the interdependent web of all existence’…so I believe that a working definition of ‘evil’ could be ‘whatever distracts us from our essential relatedness.’ Walker goes on to quote psychoanalyst Carl Jung: ‘The individual who wishes to have an answer to the problem of evil has need, first and foremost self-knowledge, that is, in the utmost possible knowledge of his/her/their own wholeness. He/She/They must know relentlessly how much good he/she/they can do, and what crimes/harm he/she/they is capable of, and must be aware of reading the one as real and the other as illusion…both are bound to come to light in him/her/them.” If we are to live for the good, we can only do so without self-deception or self-delusion. So if we affirm what Aleksandr Solzhenitsyn said in our opening words that “the line dividing good and evil cuts through the heart of every human being”, we are called to do two things, one, manage the potential to do harm within ourselves, and two, show love and compassion to those who have done harm. Even those who have harmed us. Especially those who have harmed us. Think in terms of “think globally, act locally.” Are we willing to choose that hard route of showing compassion and the transformative power of love not only to ourselves, to those we love, and to those we know have the capacity to change, but also to those who continue to do harm, who have committed terrible atrocities, to those we believe are evil? Are we able to affirm possibility in evil behavior rather than pathology or ill intent in others? It ain’t easy, folks. No one said Unitarian Universalism was easy. Yes, we have to set boundaries to protect us from harm, yes, we can’t forget the past behaviors that have harmed us or those we care about. But we can have healthy boundaries and be informed by our experiences and still have empathy, and recognize our own complicity in the process which engenders and sustains evil. We can still open our heart to those in need, both abuse victim and abuser. Let me share one story. About 15 plus years ago, the Pasadena Police Department asked me to provide group therapy to men who had been arrested for domestic violence; all had committed physical violence, mostly to their spouses. The Police Department owned a small run-down strip center just off the downtown area of Pasadena. I went by the facility before the group began, just to get my bearings. This was not a safe part of town, wheel-less cars in front yards, lawns unmowed, and rough looking people hanging around small barbeque pits drinking beers were just a block away from this mostly abandoned strip mall where I was to hold the group. So not only was I uneasy about working with violent men, I was in a very scary neighborhood. Therapy was to take place at nighttime and there was nobody else in the strip mall but me and these violent men. Before attending the first meeting, I have to say my fear, and yes I felt anger too, came from my belief that these men were evil; I believed that they had intentionally harmed someone they loved to gain power and exert control. I felt my job was to meet with these evil people and try to convert them into good people. What flaw in logic do you already see in this statement? These men were not pure evil. Like all of us, they had the potential for harm within themselves and it had come out sideways toward someone they loved. Most of them didn’t have any support system, didn’t have the skills to manage their emotions, didn’t have the verbal skills to respectfully engage in civil dialogue about difficult issues. All of them genuinely regretted their behavior. They were trying to stop their violence, but many had slipped. They had no reason to be anything other than honest with me or each other. I wasn’t there to judge them, and no one else could judge them either because they were all there for the same reason. I was there to help them and they were there to help each other. As I overcame my prejudices and fear and anger, as I taught them skills, as I showed them compassion, as I saw them as flawed, but having the potential to change, and as I offered them unconditional love, they did transform, they did change, they were able to mange the evil impulses within and actualize the good within. I followed up with some of them after their court-required treatment with me and in fact they were continuing to do well. That experience, and countless others besides, taught me to “make a determined effort to understand evil as a possibility that awaits transformation.” These are more than just words to me; I’ve seen it happen. I love reading the concepts of people about the evil and what they can make of it. It was a long post but the interest kept me going until the end. Brilliant writing.